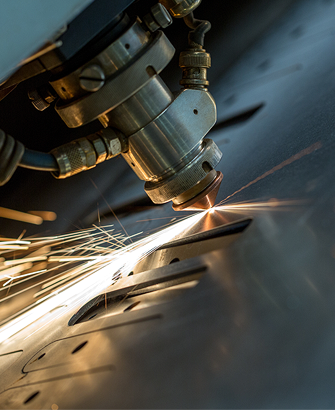 Eldred Sheet Metal offers hyper-therm high-definition CNC plasma-cutting services with True Hole Technology. We also provide metal shearing services to meet your needs. Eldred has the capabilities to shear material from 16 ga (.0625") up to 3/4" in carbon steel, stainless steel, galvanized steel, aluminum, and alloys. Shearing is a process where a moving blade bypasses a stationary blade causing the material to yield or shear. The result is material with an extremely straight cut and a slightly burred edge. Almost any geometrical shape can be achieved as long it is a straight cut. Eldred has two shears: one that shears material up to 1/4" thick and the other that can shear material up to 3/4" thick. Eldred also has two ironworkers: one 150 ton and one 60 ton. Our 150 ton ironworker is capable of shearing angle, flat bar, square bar and round bar stock.